About 3 years ago, YSL rocked the beauty world with the introduction of its now wildly popular Glossy Stains. In the aftermath of the Glossy Stains' success, a number of brands (mainly drugstore) launched copy cat products. None of these seem to have had much success. And, thus, the beauty world moved on from the glossy stain....to the lipstick/gloss hybrid. Since mid-2013, it seems that every. single. brand. 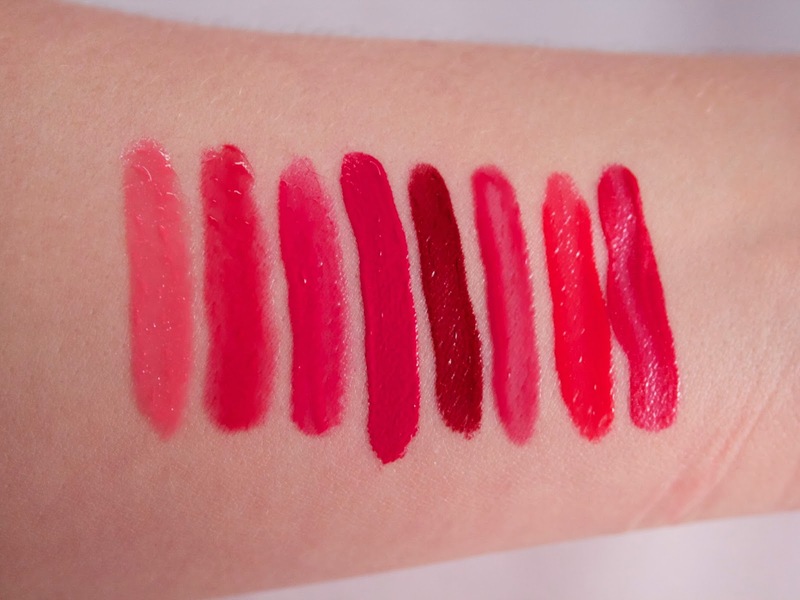 has introduced a lip stick/gloss hybrid formula and the beauty community seems to be raving about them! I've rounded up an assortment of the different formulas to, hopefully, give a helpful comparison of the major brands. As a note, I have multiple shades in each of these formulas, but have only included a swatch from one shade in each line. My aim is to give a sense of the formula/texture/opacity more than the color....I also feel less ashamed if I only include 1 from each line, rather than every color one I own! Maybelline Elixirs: These feel thick on the lips and ever so slightly sticky. The shades have quite a glossy finish, but tend to be lighter and more sheer than some of the other brands. In general, I liked these apart from the shades released this spring as part of the Bleached Neon Collection. The Bleached Neon colors turned weirdly pastel on my lips. L'Oreal Colour Riche Extraordinaires: Like the Maybelline Elixirs, the L'Oreal Extraordinaires are quite thick, but they feel creamier and are less sticky. The L'Oreal version comes in more bold and deep shades (and are more opaque than the Maybelline). I find these very comfortable to wear and exceptionally long lasting. Revlon Colorstay Moisture Stains: Revlon's formula is one of the newer ones, only hitting drugstores during the spring of 2014. The formula is much thinner than either the Maybelline or L'Oreal. I also like it far less than the aforementioned two as it is quite finicky to apply--it works best if you apply two thin layers (like the YSL Glossy Stains). Even then, though, both shades I own apply a bit streaky. And while it looks very pretty once it settles, as the color fades, it has a tendency to get those weird stringy bits between your upper and lower lips. Rimmel Apocalips: Out of the products featured here, the Rimmel and the Shiseido are the only ones with a traditional doe foot applicator. I personally prefer the doe foot, as I find it the easiest way to get a clean application on the lips. And given how pigmented the Rimmel Apocalips are, precise application is a must. They do have a bit of a weird smell and are less glossy than some others. I also find that a lot of the shades within the range look alike, and I prefer the pink and red shades to the mauves and neutrals. Shiseido Rouge Lacquers: These have the most über-pigmented and thinnest formula. They are high shine, but not glossy in the way that many of the others, like the Maybelline or Lancôme, are. Rimmel Apocalips is probably the closest dupe to the Shiseido Lacquers. Shiseido is such a consistently great brand that doesn't get much attention, but all of their lip products are worth a look. Lancôme Lip Lovers: I've saved the best for (almost) last. The Lancôme are by far my favorite formula. They have a more jelly-like texture than many of the others and are thinner than the drugstore brands. They have good pigmentation, but are less opaque and more glossy than the Dior. As an added bonus (or yet another threat to my wallet), I could probably happily own and wear every single shade in this line. 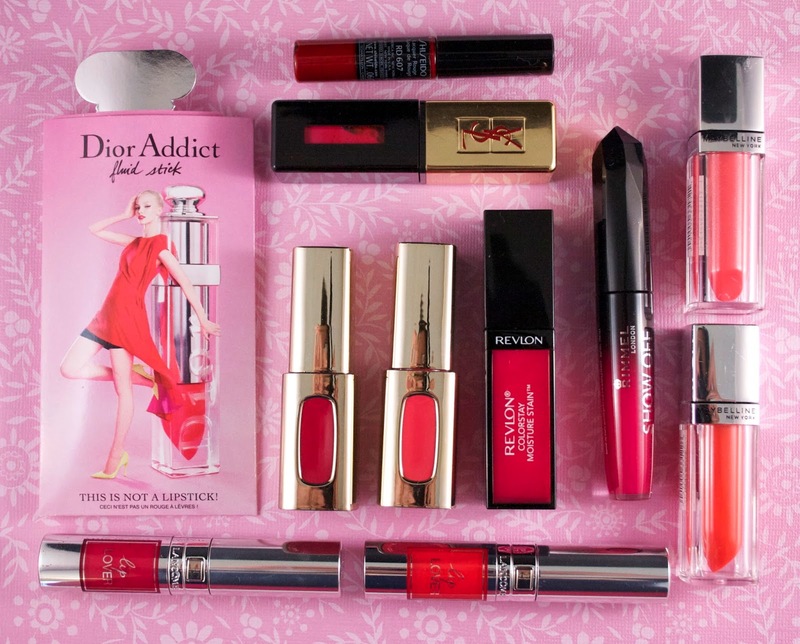 Dior Fluid Sticks: The Fluid Sticks have a thinner formula than the Maybelline or L'Oreal. In terms of drugstore matches, texture-wise it is most similar to the Revlon. Fortunately, though, unlike the Revlon it is super easy to apply. It applies incredibly evenly and really only requires one coat to give an opaque, glossy finish. The Dior would be a contender for my favorite formula, but I don't love the shade range. YSL Glossy Stains: I wasn't entirely sure whether I should even include the YSL on this list, since I find them to fall into a slightly different category than the rest on the list. As a popular choice that many people have tried, though, I thought it would be a good reference point. The YSL Glossy stains have a thin formula, with a strong smell. These are less glossy than the Lancôme or Dior, being similar in look to the Revlon Moisture Stains. Common gripes about the Glossy Stains are that they are sticky and a bit tricky to apply, requiring two layers. I still love mine, though, and own 6 different shades. But they are more high maintenance than my favorite, Lancôme, and feel less moisturizing on the lips than many of the others on this list. Which are your favorites? Any shades that you like in particular? If you want to stay connected on social media, please follow me on Bloglovin, Instagram, and Twitter!